Wawel Royal Castle is something of a Polish Camelot. Large, impressive and woven of countless legends, castle Wawel stands on the eponymous hill overlooking the historic center of Krakow, over the Vistula River. 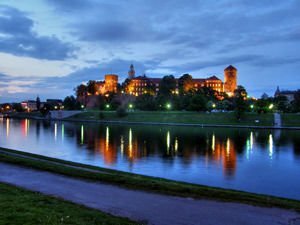 You also receive beautiful river Vistula, and with the Royal Palace Wawel, the hill is dominated by the magnificent Cathedral Wawel. The whole hill is an intriguing complex of Renaissance and Gothic buildings, which today is a symbol of Krakow, and one of the biggest attractions of the city. Legends tell how and why Wawel became the symbol of the Polish city. According to legends, it all starts by Prince Krak, who was the first lord of the village, located somewhere between the rivers Danube and Rhine. This land was designated by the Romans as barbaric. Prince kills the dreaded dragon Wawel living in a cave under the hill and laid the foundations of Krakow. It is the name of the dragon Wawel over the centuries become a symbol of Krakow. Renaissance royal palace Wawel brings the history of the local arable land and Krakow which for centuries was the capital of Poland and the bosom of kings, musicians, artists, scientists and artists. Wawel Castle divides the city in it’s two main parts - one side stands the Old Town and the other is the Kazimierz district, with its ancient synagogues in the southern part of the city and the Gothic cathedral where kings were buried in Poland. Wawel is the residence of Polish kings for over 500 years until the end of 16 century, when Warsaw became the capital of Poland. Situated on a cliff above the Vistula River, even today Wawel remains the biggest symbol of the Polish Kingdom. Early in the 12th century Krakow started being the royal seat. Fortress on the hill Wawel was there before, but the present palace began to be built during the reign of Casimir III the Great, between the 1333-1370 year. Then the palace was burnt, but it gives new impetus to the building, which forms the current complex, and represents a unique combination of Gothic, Baroque and Renaissance architectural styles. King Sigismund III Vasa brings significant improvements and extensions in the construction of Royal Palace Wawel. In the years during World War II, Royal Palace Wawel was looted by the Nazis, but many of its values are preserved to this day. In the halls and corridors of the castle can be seen strikingly beautiful, rare and impressive numbers of tapestries. This is the largest collection of such tapestries throughout Europe. They are set among richly decorated and ornate interiors of the premises of the Wawel castle. Everywhere you can see magnificent baroque furniture, and gilded ceilings. Among the other attractions around the Royal Palace Wawel are the Cathedral of St. Stanislav and St. Wenceslas, the monument of Tadeusz Kosciuszko and cave of the legendary dragon.